A Christmas movie that isn’t about Christmas. 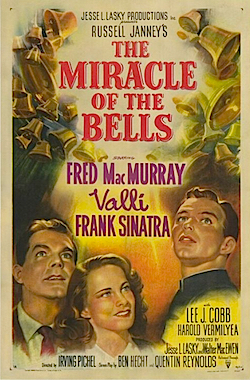 That’s a good way to sum up The Miracle of the Bells (1948). Actually, it might be better to say that it’s a great Christmas movie that isn’t even remotely about Christmas. And, for the record, one of the sweetest scenes in The Miracle of the Bells takes place on Christmas Eve in a Chinese restaurant. Still, what runs both wide and deep in this film is love. Now, might not sentiments such as these find themselves comfortably wrapped in a bow and placed, ever so tenderly, underneath the Christmas tree? Frankly, until I saw it listed as part of The Tivoli Theater’s annual Christmas movie celebration, I’d never even heard of this wonderful little film. Man, am I ever glad they decided to show this not-really-a-Christmas movie at Christmastime! This was so beautifully written, Scott. And makes me want to see this – even though you know how I feel about old movies! Sounds like this one is due for a re-visit.